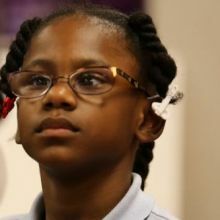 Brielle is a hardworking first grade student at Austell Elementary. She has overcome many hurdles in her life and does not let her disability get in the way. 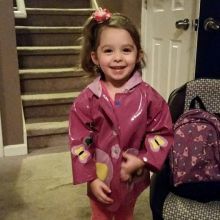 Brielle is the sweetest girl that anyone could ask for and a delight to see on a daily basis. She always has the biggest and brightest smile. Brielle is sure to have a successful future. 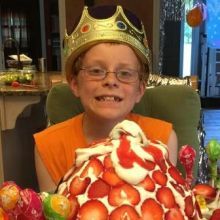 Born at 32 weeks with a stroke, and weighing three pounds, Alex Ham-Kucharski soared beyond his diagnoses of cerebral palsy, autism, and severe to profound hearing loss, to medal in Special Olympics equestrian, track and field, bowling, and swimming. He just graduated high school, with honors, and will be attending Georgia Gwinnett College's Early Childhood in Education Program, so he can help children like him achieve their dreams, just as he has done. Liam is 7 years old and has autism. 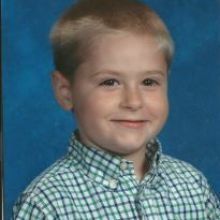 When he was diagnosed at 2 years old, he had no verbal or social skills. After 5 years of therapy and special education, Liam now speaks but still struggles with annunciation and non-literal concepts. He now has a few "school friends", but mostly prefers to play by himself. 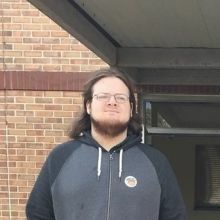 Liam recently moved to Georgia from Louisiana and is transitioning pretty well, thanks to the many activities available in the greater Atlanta area. Vehicles, all of them, have been his obsession for quite a while, but he has shown a recent interest in baseball. Andy is very happy young man who enjoys socializing with others. Andy is very popular among his peers and has enjoyed working in the school coffee shop and taking pictures for the WHS yearbook. Andy loves photography and recently won an award for one of his pictures. He always tries his best and is eager to please others. We think Andy is GREAT! 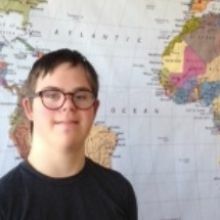 Adam is a 20 year old young man who loves to read, play on the computer, play adaptive baseball, and is an active participant in Special Olympics. 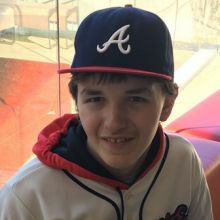 Adam loves to go to Braves games, the movies, bowling, anything Disney, and especially loves summer camp! At three weeks of age Gabby tested positive for Group B Strep. The doctors didn't give her family much hope and after being told if Gabby was lucky enough to live she would never walk, talk, see or hear. However God had bigger plans for this little girl. Not only can she do all of the above but she can also ride a horse without assistance. Gabby's love for horses began at the age of three and in fact only after starting hippo thearpy did Gabby begin to walk. 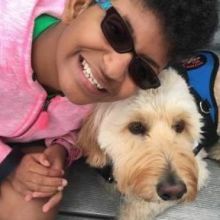 Gabby is now fifteen and continues to amaze the doctors and her family because you can't tell Gabby she can't do something because she will show you she can. She is our little miracle , with a whole lot of sassy. 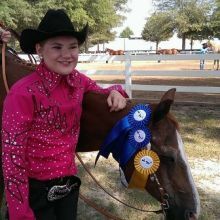 Gabby participates in Special Olympics and is a member of the Newton County Special Olympics Equestrian Team, and also plays on the Miracle League . 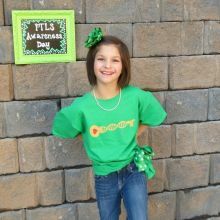 Makenzie is a triplet who is autistic. She enjoys going to school, singing in the school chorus, archery, horses, and hanging out with her family. She is shy around people that she doesn't know so we try to get her into as many activities as we can. Her sister plays travel softball while her brother plays baseball, so she supports them all of the time too!! Dominic is so smart and does not let his autism get him down! He loves people and adventure! 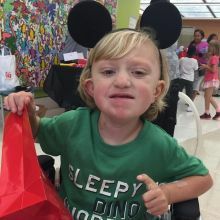 Grant was diagnosed with Metachromatic Leukodystrophy (MLD) just over 3 years ago. It's a terminal illness that affects his mental and physical abilities. Grant has a great personality and loves life. Baseball is one of his favorite sports. 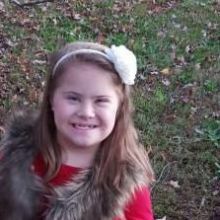 Cassie is a 9-year old with Down syndrome, and she is a rock star! She loves to move to the beat and be the center of attention, and her smile lights up a room! If you vote for Cassie, she would love to give you a great big hug! She has never been to a Braves game, as she moved here from Michigan just about a year ago. She wants to be a cheerleader, so I am sure she would cheer the Braves on with all she's got. Vote for Cassie! Clayton Blackwell was born August 27th, 2012 weighing 1lb and 10oz. He spent the first 8 months (254 days) of his life in the Scottish Rite NICU. 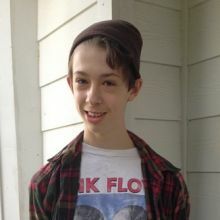 Clayton had a stroke in utero that covered the entire left side of his brain and some of the right. He required oxygen, feeding tubes, and countless medicines. I was told that Clayton would not live to see his first birthday. Today, we are getting ready to celebrate his 4th birthday. Clayton is on the autism spectrum. He does not require oxygen or feeding tubes. He LOVES music, books and water. He does not speak yet, but that does not stop him from finding new ways to communicate. 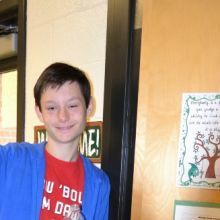 Clayton enjoys school and strives to learn something new each day. 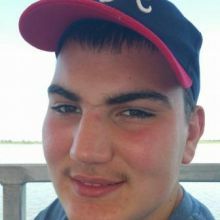 Antonio is 17 years old who has a learning disability as well as other medical conditions. He has had 6 operations, including brain and heart surgery. Antonio lives and breathes sports. You can bet that on any given day he is either sporting something with the Georgia Tech, Falcons, Braves or Harrison Hoya's logo. Antonio loves assisting the Hoya's football team and being on the sidelines at all the games. His energy and love of life and people shines through in everything that he does. Please vote for this kind young man. 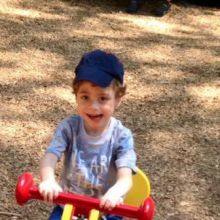 Justin is a very sweet five year old boy who is in special needs preschool. Justin has a very big heart and is sweet to his friends. He is a joy to be around and puts a smile on everyone's face! Devon is a boy with autism and brain damage from birth. He is such an amazing kid. He always has a smile on his face and is always positive. His father works out of town 99% of the time and we don't see him much. He is 15 and loves to spend time with his brother who is on the spectrum as well and his best doggy friend Ziggy. Sam is a HUGE baseball fan! All of his favorite things are baseball, or sports, related. 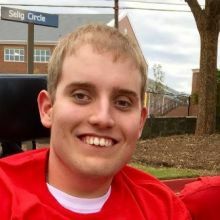 But, despite having a genetic syndrome which makes him larger than average, it is hard for him to participate in sports because of the symptoms from his syndrome. He will be so happy if he is selected! 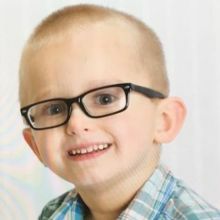 Jonah was born with midline birth defects to include four major heart defects and a cleft palate. He has been hospitalized more than 16 times and he has had six surgeries including 3 heart surgeries. He receives occupational, physical, and speech therapies up to four times per week. Despite all this he has a smile that will melt your heart and loves to greet people with a hug. Jennifer is three years old. She has been diagnosed with Significant Developmental Delay. Although, very shy at first, once she gets comfortable, she'll light up your world with her beautiful smile. She's very sweet and caring, almost like a mother hen around those who may need a hand. Emily Rocks! 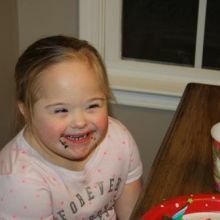 She is a 6 year old girl who has Down Syndrome. She is a cancer survivor (Leukemia), she is entering Kindergarten this year, and she loves CAKE! Brad Lee is 16 he loves baseball, horseback riding and bowling . He is insulin dependent diabetic with autism , but he doesn't let this stop him. He is a happy fun loving guy. Please vote. Ava Pulley is a ten year girl with a rare genetic disorder called Potocki Lupski Syndrome. She loves life and is one of the happiest kids you'll ever meet. Ben is 14 yrs old and loves life. He enjoys watching movies, listening to music and roller skating. 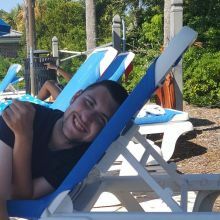 Though he struggles with autism and epilepsy that add challenges to his day to day life, he will always greet you with a smile and a question about what your favorite food, movie or color might be. Triston is the 6-yr-old brother of Jason Waskey. 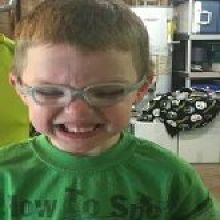 Triston had a stroke when he was born, which caused partial paralysis of his mouth. 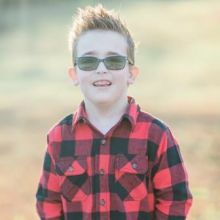 He also has a less severe form of Ehlers-Danlos Syndrome, which affects the connective tissues in his body. Triston is a fun-loving, all-American boy! He plays recreational baseball, soccer and basketball. He is absolutely devoted to and very protective of his medically fragile brother Jason. Katelyn is a feisty 8 year old in 3rd grade. She has a Chiari Malformation, epilepsy, a rare chromosome disorder, hydrocephalus, autism, and ADHD. She had three brain surgeries at 4 years old (Chiari decompression surgery, shunt). She loves sports but is very restricted due to part of her skull missing and her Chiari. She is the middle child of 5 (one of which is also autistic). As such a large family and 2 with special needs, we do not get a chance to go to any events/"fun things" according to her. We would love to make a special memory for her!!! Carter is a lively 8 year old. He loves to play baseball on the Horizon League in the spring and fall and is anxiously awaiting his upcoming kickball league. One would never know that 7 years ago we sat in a doctor's office crying our eyes out with doctors telling us our child may never walk, talk or eat on his own. That is just Carter for you! He always amazes us in all he does. 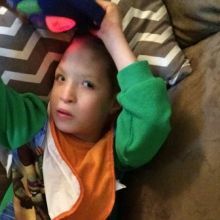 He has a mitochondrial disorder, which means his body doesn't produce enough of the right kind of energy. You would never know this as he battles with his light saber awaiting his big screen break in Star Wars. Carter will brighten anyone's day with his amazing smile and crazy sense of humor. 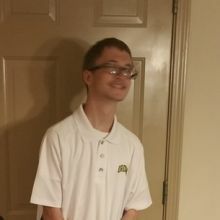 Collin is a friendly 16 year old with moderate intellectual disabilities, developmental delays and Juvenile Diabetes whose first love is video games, but recently developed a love for supporting his Harrison Hoyas in Football and Basketball. This year he has been working with the basketball team and twice a week works in the Student Coffee Cafe. He loves attending sporting events (especially with his dad), loves to travel and anything that allows him to be social with other teenagers. Hi! This is Benton! He is 5 years old and has Autism. He talks but mostly repeats phrases and words LOL. 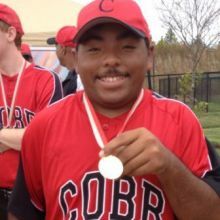 Benton LOVES Baseball and has played Special needs Baseball for the past 2-3 seasons. He also loves music and dances to Blak Shelton and can recite almost all songs that play over and over on the radio. Crazy right? He is really smart but has trouble Doing simple things that we take for granted. Like, holding a crayon and drawing.. Blowing bubbles..potty training.. Writing his name.. BUT... He is my smile and my miracle. I tell Benton every night after we pray (and I sing "you are my sunshine ") that he makes me happy! Noel is a student with a moderate intellectual disability. He is a very happy student who enjoys coming to school. He loves to please you and will help you in any way that he can. 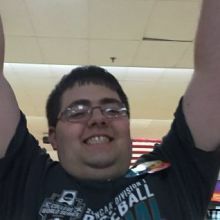 Noel loves sports and enjoys interacting in games and activities. This would be such a great opportunity for him! Jessie is adopted from Brazil. She came to the US when she was 2. 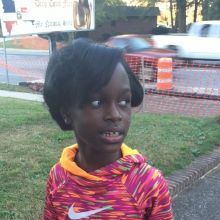 She has autism, Fetal Alcohol Syndrome, hearing loss, ADHD, and anxiety disorder. For the past 4 months, she has also been dealing with a psychotic reaction to a medication. None of this has slowed her down. Jessie and her service dog, Mo, are still enjoying life. They go to therapeutic riding and trapeze lessons every week. Jessie enjoys music, singing and helping others. Jazzmyn Mariah is a sophomore at EHS and pursuing a pathway in Performing Arts. She has a history of mental health challenges that she works everyday to overcome. She has a love for life and is a free spirit. 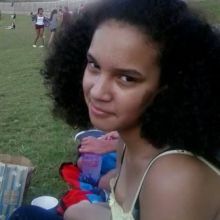 Mariah is following her big brother's footsteps by getting field experience in the film industry as a background actor. Timmy was born with a very rare birth defect called Chromosome 2P Deletion Syndrome. He is non-verbal, has conjoined kidneys, is mentally handicapped, and a slew of other abnormalities. He is one of the only known cases in the world. This amazing boy has beat so many odds. The most recent being in November of 2015. Timmy contracted bacterial meningitis. He had to have emergency brain surgery to save his life. He was kept sedated for 7 days and was hospitalized for almost a month; getting discharged the Friday before Christmas. This tough and blessed little guy has never lost his smile. He has a contagious smile. I truly believe God has a huge plan for Timmy. He is truly a special boy!!! 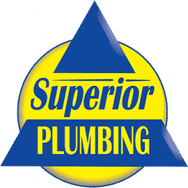 John has autism/ aspergers. Has very little social interaction. Prefers to stay to himself. 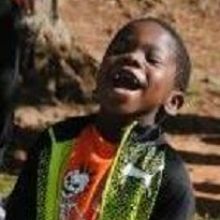 Ian is a happy, energetic 11-year-old with 22Q Deletion Syndrome, classic Autism, ADHD, and Severe Speech & Language Impairment. More importantly, Ian has a loving family, amazing big sister, loyal and tolerant dog, and a team of big-hearted professionals whose patience and perseverance surprises me. Ian loves snow, slides, roller coasters, trains. Above all, I think he wishes he could fly. Ian works really hard to communicate and use language. We are all very proud of Ian...he's a happy kid and a hard worker too. 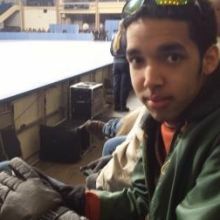 Demetri is a very determined young man with Autism and Ulcerative Colitis. 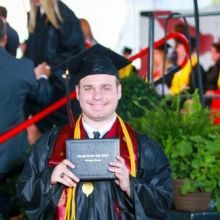 He fought through his medical issues to graduate High School and is in line to attend Warm Springs School for independent living skills and plans to take a new course offered there for 3D printing. While he has been waiting for his spot to open up, in May, he has been pursuing his interest in acting. He has worked as a background extra in many movies and TV shows, and also writes hus own screen plays and creates character's. His goal is to become a writer/prodecer/director/actor and I have no doubt he will make a place for himself doing what he loves. Thank you for considering him in your vote. 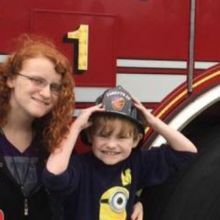 Paxton was recently diagnosed with high functioning autism, severe symptoms. Paxton is full of energy, loves trains, space, numbers, classical music, videos and reading. He loves being a very protective big brother. Paxton is six years old, and in kindergarten. 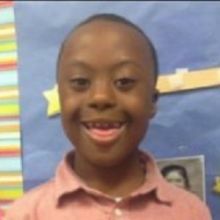 Reece is a fun loving 8 year old with down syndrome. She has a smile that would light up a room. 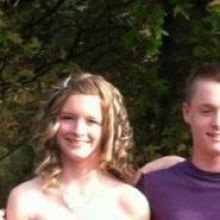 She enjoys school, enjoys sports, and is fun to be around. Carmella was born at 28 weeks weighing only 2 pounds 8 ounces. She was diagnosed with a Grade 4 brain bleed and Hydrocephalus. She currently suffers with cerebral palsy and has a stiffness and weakness on her left side of her body. 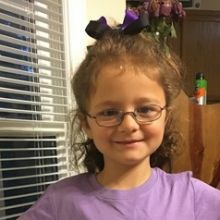 Carmella attends Head Elementary and is in the 3rd grade Moderate Disability classroom. Austin is a wonderful young man that loves to socialize and loves sports! He is a die hard sports fan and knows the stats of all the teams and players! He loves to do things with other kids! Please vote for Austin so he can have the opportunity to go to the Superior events and do the things he loves! Deven is an amazing young man who doesn't see limits to what he can do. 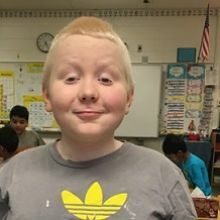 Even though he has Albinism, which affects his vision, and Apraxia, which affects his ability to speak, it doesn't stop him from conversing and engaging in lots of activities and conversing with everyone he meets! We are so proud of Deven and know he will succeed in everything he does throughout his lifetime!